The interior spaces reflect the same attention to fine detail and craftsmanship. The house, originally built in 1990, has been constantly upgraded and has a total of 12 rooms (open, spacious and lofty) including 4 bedrooms and 4 bathrooms. Two voluminous Master bedroom suites - one at the end of each of the main wings - afford luxurious privacy. An expansive central living area around the floating fireplace is accented at one end with a 65" high definition television screen with additional audio/visual equipment concealed in a niche hidden by fabric art. Balconies wrap around the open living and dining room and allow natural light to infuse the entire area. The huge open kitchen is a gourmet's dream come true (all appliances and audio and video equipment remain). The luxurious executive office and study upstairs make telecommuting a very attractive alternative. Two more bedrooms and an exercise room are also on the second level. Wireless internet access is supported throughout the house and outside on the private, and consequently secure, lawn areas. A full security system protects the premises. The primary living areas and master bedrooms are all on one level. If access becomes an issue, the structure is pre-framed for an elevator. The spacious living area is 40 feet long (12.3 m.) and easily accommodates entertaining large numbers. The unique window arrangement allows light from all four sides, and above, to bathe the room in an ever-changing pallet of light. High above the room two large electrically operated skylights allow fresh breezes to be finely controlled. The centerpiece of the living room is a one-of-a-kind South African black granite fireplace. The see-through design allows unobstructed views of the grounds beyond. Concealed lighting in the pedestal creates a floating effect after dark. The gas fireplace is controlled either manually or thermostatically. Between the Living room and the Kitchen is a compact outdoor Chinese garden with water feature, seating area, black bamboo and Japanese maple trees. The three doors that open onto the Living room may be opened to create an unobstructed passage  giving the advantage of an additional outdoor room adjacent to the Living room. For smokers this is the perfect solution to a smoke-free home. The long architectural glass table provides seating for eight, and the matching sideboard uses the same South African black granite as the fireplace. This visual continuity gives one a flowing feeling as one looks across or moves between the spaces. The wood for the built-in American black walnut cabinetry originated on the property. Brazilian granite, all gas KitchenAid appliances, and clear Western cedar custom cabinets coordinate harmoniously to create an environment in which everything culinary is possible. The traffic flow pattern makes this room a delight to work in. Cabinet space is extravagant and is supplemented by two additional walk-in pantries on either side of the kitchen. A year’s subscription to an organic vegetable service is included. Patterned on a New England lighthouse, these stairs were built of lumber felled on this property. The one-of-a-kind handcrafted solid oak staircase spirals upward to the second floor and onward to the roof level. From the outside this stair tower gives vertical balance to the horizontal linear aspects of the structure. A compact and convenient media room is hidden behind the "pass through" entertainment wall. 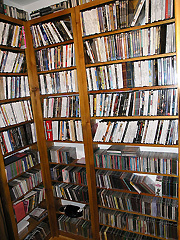 Here you find ample storage from floor to ceiling and equipment for all types of media from DVDs, CDs, tapes, LPs etc. This room also allows for easy access to equipment wiring. Kohler is the selected brand for the vast majority of fixtures throughout the home. From the matching black triple sink in the kitchen to the family-sized hot tub in one of the Master suites, Kohler designer quality is everywhere. Imagine yourself immersed here with a fine glass of wine and a beautiful full moon outside. For the ultimate in pampering there are two Master Bedroom suites. From the private patios to the 6, 10 and 12 foot sliding Anderson wooden doors, these rooms will define the comfort and intimacy you will come to enjoy with this extraordinary property. Floor-to-ceiling bookshelves on opposing walls greet you in the office and study. A cherry executive desk and conference table (included with the property) completes every service requirement to run a business. Abundant natural light and windows with beautiful views create a perfect environment for quiet concentration away from busy living spaces. The convenienlty located solarium is a great space for reading, potting plants, babying your favorite orchid or even having a romantic moonlight dinner for two. Just off the Kitchen area this special place can be whatever you want it to be.